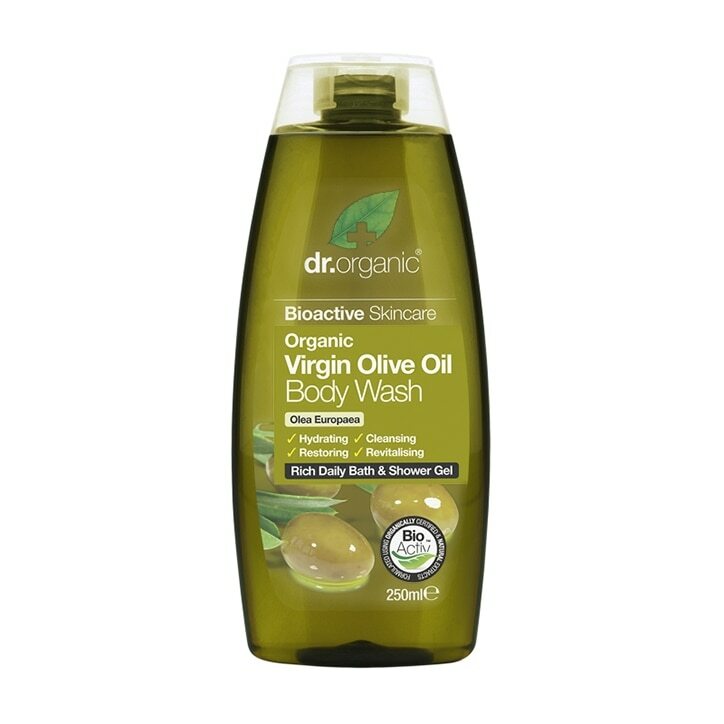 Dr Organic Olive Oil Body Wash is a deeply nourishing body wash for shower or bath which leaves your skin gentle cleansed and softened. Pure organic virgin olive oil is a deeply moisturising oil rich in nutrients, including oleic acid. Dr Organic has combined this pure form of olive oil with a proprietary blend of bioactive, natural and organic ingredients. The result is an intensely moisturising and nutritious body wash with incredible hydrating and cleansing properties. Refresh and replenish your skin with organic bioactive nourishment. Aloe barbadensis leaf juice, Aqua, Sodium cocoamphoacetate, Sodium lauroyl sarcosinate, Cocamidopropyl betaine, Lauryl glucoside, Coco glucoside, Glyceryl oleate, Shea butteramidopropyltrimonium chloride, Sorbitan sesquicaprylate, Olea europaea (Olive) leaf extract, Citrus medica limonum (Lemon) peel extract, Vitis vinifera (Grape) leaf extract, Thymus vulgaris leaf extract, Foeniculum vulgare seed extract, Potassium sorbate, Ascorbic acid, Parfum, Ribes nigrum, Sodium hydroxymethylglycinate, Citric acid, Amyl cinnamal, Benzyl salicylate, Geraniol, Hydroxycitronellal, Linalool. Dr Organic Virgin Olive Oil Body Wash is rated 4.6 out of 5 by 22. Rated 5 out of 5 by Trippie from The best body wash! Left my skin feeling hydrated, and soft, it also smells absolutely amazing, I have dry and sensitive skin and this product did not make my skin irritated at all! The gel is so soft and lathers up really well, and a little gel goes a long way! I would definitely buy this body wash again. Rated 5 out of 5 by Simo81rm from Great product! I love it! Me my partner and baby girl all using it!